The Asus Chromebook C202SA is a great first laptop for a young child, but it can also stand up to the rigors of school life for older kids. 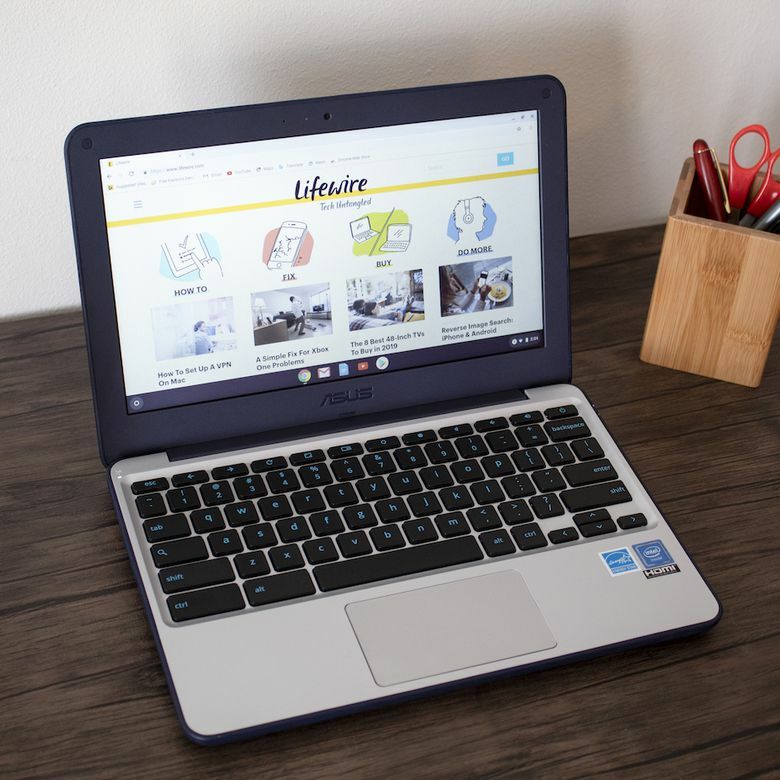 The Asus Chromebook C202SA is an ultraportable laptop with enough ruggedization to stand up to daily use in and out of the classroom. With a durable build, comfortable keyboard, and excellent battery life, it’s a great device for a child or adult alike, though performance won’t blow you away. Since it’s specifically aimed at students, it’s important to consider factors like battery life, durability, and performance to determine whether a laptop like this fits the bill. To help you understand exactly how well the C202SA is likely to perform in real-world conditions, we put one to the test around the office, and even took it home to see how it stands up to constant use throughout the day. The Asus Chromebook C202SA looks tough, feels tough, because it is tough. To be clear, we’re not talking about military grade ruggedization, but this is a laptop that’s definitely built to stand up to the rigors of daily use, even if that daily use involves being thrown into a backpack, lugged to and from school, and even dropped from time to time. Unlike some semi-rugged Chromebooks that miss the mark in terms of styling choices, the C202SA has a unique enough look while not crossing the line into looking like a child’s toy. The case is white plastic, which a pleasing texture on the lid, surrounded by a navy blue rubber bumper that’s designed to protect the unit in case of a drop. Perhaps the most welcome design choice, given that the target demographic includes kids, is that the keyboard is spill-proof. The laptop as a whole isn’t waterproof, or even water-resistant, but spilling a drink on it won’t ruin the keyboard, let alone the logic board. The hinge also has a beefy feeling to it, and it’s designed to allow the lid to open a full 180 degrees and lay flat on a table or desk. This is billed as a way to make it easier for kids to share information in group settings at school, but poor viewing angles are likely to make that difficult in practice. In terms of ports, the C202SA covers all of the basics. You get two high-speed USB 3.1 ports, with one located on each side of the laptop, a full-sized HDMI port, and a full-sized SD card reader. You also get a headphone jack. The case itself lacks vents, aside from the tiny speaker grills, and the laptop actually runs totally silent because it doesn’t even have a fan inside. This is possible due to the extreme efficiency of the chipset, which also contributes to pretty great battery life. Chromebooks are pretty basic when you get right down to it, and that’s reflected in the setup process. The C202SA, in particular, is almost ready to go the moment you take it out of the box. When you first boot it up, you’re prompted to enter your Gmail username and password, and that’s just about it. The C202SA has a unique enough look while not crossing the line into looking like a child’s toy. Even with two-factor authentication enabled, the entire setup process still only takes about two minutes. After that, you’re ready to start using your Chromebook. You will have to download and install a system update the first time you shut the laptop down, and you’ll also have to download and install whatever apps you need, but those are pretty painless as well. The C202SA has an 11.6-inch screen that uses a native resolution of 1366x768, which is pretty common for Chromebooks of this size. Those who are more used to full HD (1920x1080) laptop and desktop resolutions may feel a little cramped, but the image quality doesn’t suffer from noticeably blocky pixels because of how small the screen is. In terms of brightness, the screen is also pretty much in the middle of the road. It’s fine for most indoor use, but it’s a little dim for regular use in direct sunlight, and that just gets worse when using it outdoors. One nice thing about the C202SA screen is that it has a matte finish, which does cut down on blinding reflections when using the laptop in direct sunlight. We found it a whole lot easier to use the C202SA outdoors in bright sunlight than most of the competition due to its anti-glare display, despite the fact that the screen itself isn’t terribly bright. That said, colors are a little muted, and the viewing angles aren’t great. The screen looks fine when viewed head on, but tilting it any direction washes the colors out even further, and noticeably dims portions of the display. The C202SA has a lay-flat hinge, which means you can fold the lid all the way back until the screen is laying flat. Asus bills this as a useful feature for students working in group settings, but students using the laptop in that fashion would be hard pressed to see the screen without putting their heads together directly over it. The C202SA achieved a score of 4632 in the PCMark Work 2.0 benchmark test, which places it in the middle of laptops we tested that had substantially similar hardware. With a 1.6 GHz Intel Celeron N3060, Intel HD Graphics 400, and 4GB of RAM, there are some pretty hard limits on the type of performance that you can reasonably expect out of this laptop. We found it a whole lot easier to use the C202SA outdoors in bright sunlight than most of the competition due to its anti-glare display. In practice, we found that the C202SA is able to handle basic tasks like web browsing, writing emails, and word processing without a hitch. However, we did notice some lag in the browser with multiple tabs open, with the issue grows worse depending on the number of tabs and complexity of the sites. We also noticed some slowdown when loading especially large spreadsheets in Google Docs. Even though the C202SA is designed for tasks like web browsing and word processing, we also performed a couple of GFXBench benchmark tests on the unit. The C202SA was unable to run the standard Car Chase 2.0 benchmark, so we opted for the OpenGL Aztec Ruins test. The picture quality looked fine during the test, but the results of the test were predictably poor, with the C202SA mustering only 10.1 FPS (frames per second). That’s marginally better than other units we tested with similar hardware, but just barely. We also performed the OpenGL T-Rex test, and it performed better there, managing a more acceptable 34.2 FPS. That’s more or less in line with the results we’ve seen from similar hardware. The takeaway is that you should be able to run some of the more basic games that are available in the Chrome Web Store, but this laptop isn’t designed for gaming. The C202SA is a Chromebook, so it’s designed with productivity in mind. There’s a lot of software it can’t run, but it excels at basic tasks like email, word processing, and web browsing. It also has access to the Chrome Web Store, which means you can use a lot of Android apps that older Chromebooks aren’t able to install. The keyboard is surprisingly good for a Chromebook in this class, which reflects the sort of quality that Asus is known for. The keyboard is just a bit over 2mm in travel, which makes the keyboard more comfortable to use than a lot of other inexpensive Chromebooks where you don’t get much of a physical press. The keys are also sized and spaced adequately even for adults with fairly large hands. That makes the keyboard comfortable to type on for long periods of time. Chromebooks in this class aren’t known for awesome speakers, which is understandable. There just isn’t a whole lot of physical space to work with, and expensive audio components would likely bump the price up to match. That said, the onboard speakers here aren’t that bad. It does feature stereo sound, with tiny speaker grilles located on the left and right sides of the laptop. The bass response is decent enough for such a small laptop, and both mid and low tones came through clearly when streaming music and videos. We found that the audio does get worse the higher you set the volume, which is another common thread with these smaller and less expensive Chromebooks. The solution is to plug in your favorite set of headphones, which is easy due to the fact that the C202SA includes two USB ports and an audio jack. The C202SA doesn’t have an ethernet port, so you have to rely on the built-in Wi-Fi for internet connectivity. The Wi-Fi works just fine, with no dropped connections or signal issues in our testing, but we experienced significantly slower speeds than we did with other similar Chromebooks. In our testing, the C202SA managed a meager transfer rate of 70 Mbps down and 60 Mbps up when located right next to our router. By way of comparison, a more powerful desktop in the same location achieved 212 Mbps down when connected to the same Wi-Fi network, and 400 Mbps down when connected via Wi-Fi. When we put a wall between the C202SA and the router, attenuating the signal to about 80 percent, we didn’t see any reduction in download speeds. However, when we moved far enough away to cut the signal down to 50 percent, we saw a reduction down to about 40 Mbps. These inexpensive Chromebooks do tend to achieve slower speeds than more powerful hardware, but similar Chromebooks notched better results in our tests. For example, we tested the Acer R11 Chromebook under the same conditions, and it was able to achieve download speeds of 335 Mbps. The C202SA includes a front-facing camera that captures video in 720p, but the image quality isn’t very good. Pictures taken with the camera looks like they’ve been processed through an impressionist filter, and video is grainy. The keyboard is just a bit over 2mm in travel, which makes the keyboard more comfortable to use than a lot of other inexpensive Chromebooks where you don’t get much of a physical press. The bottom line is that this isn’t a camera you’d want to rely on to video conference for your job, but it’s perfectly suitable for basic video chat on Hangouts or Skype with friends and family. Since this laptop is primarily meant for children, the relatively low video quality isn’t that big of a concern. Battery life is one of the C202SA’s strongest suits. Between its relatively beefy battery, power efficient CPU, and fanless passive cooling design, this is a laptop that a child could easily use all day at school, complete their homework after school, and not have to plug it in to charge until bedtime. To test the battery in the C202SA, we subjected it to PCMark’s Work 2.0 battery test. This is a test that cycles through several different simulated work environments, including word processing, video editing, and photo editing, which is likely to be a lot more intense than any actual use scenario. During that test, it lasted for over 9 hours under constant load, with the screen set to full brightness. We also subjected the C202SA to general daily use, including tasks like word processing, web browsing, and streaming videos, and found that we were able to get over 11 hours of use out of it. With the screen brightness turned down, and putting the laptop to sleep between classes or when not in use, a child could easily expect this laptop to last all day between charges. The C202SA is an Asus Chromebook that comes with Chrome OS installed, so it’s pretty basic out of the box. If you’re unfamiliar with Chrome OS, the idea is that you accomplish most tasks, like email and word processing, through the built-in web browser. This meets the bare minimum for basic productivity tasks, but you’ll need to download additional software to get anything else done. In addition to the basics of Chrome OS, the C202SA also has access to the Chrome Web Store, and it’s capable of running Android apps. That means you can download and install a massive number of apps, many of them free, or with free versions, to increase the functionality of the laptop. Compatibility with Android apps isn’t guaranteed, but it is pretty decent, and Google is always working to improve the cross-pollination between its two platforms. With Chrome OS, you also have the option of dual booting Linux, which is a free, full-featured operating system. Doing so gives you access to even more free software, but it does require a level of technical knowledge that’s likely to go over most kids’ heads. However, installing Linux on a Chromebook is a fun project for children who are into computers, and Chrome OS makes it easy to undo everything and return the laptop to its factory original state if something gets broken. The Asus C202SA Chromebook has an MSRP of $229, which is pretty good for a Chromebook with this hardware and ruggedized design. You can find cheaper Chromebooks, but they won’t offer the same excellent drop protection, spill-proof keyboards, and other features that make this a great Chromebook for kids. If you’re willing to pay a little more, or you don’t care as much about durability, then you can find 2-in-1 Chromebooks with similar specifications. You won’t find a 2-in-1 at this same price, or at least you won’t find a good one. However, the option is there if you have room in your budget. The C202SA lags behind the competition in some areas, but it really shines in terms of durability and battery life, which are both very important features to look for when the intended user is a young student. The competing Samsung Chromebook 3, similarly outfitted, is similarly-priced to the C202SA and has a slightly more attractive design. It even includes a similar spill-proof keyboard, which can cut down on expensive repairs due to momentary lapses in attention. However, the Chromebook 3 lacks the excellent drop protection of the Asus C202SA. If you’re willing to pay a little more, you can find 2-in-1 Chromebooks that offer similar specs, and slightly better performance, with the option to use them as either laptops or tablets. For example, the Acer R11 2-in-1 Chromebook has similar specs, and you can use it as a tablet, but it has a higher MSRP of $299. You also lose the ruggedization, which makes a device like the R11 better suited to older students, and even adults, than younger kids. Take a look at other product reviews and shop for the best laptops for kids available online. The Asus Chromebook C202SA is an excellent choice for students and young children, with its spill-proof keyboard, excellent drop protection, and raised rubber foot that makes it easier for small hands to carry it around. The excellent battery life is also key, since it provides plenty of power to last through a long school day. The C202SA even makes a decent choice as an ultraportable second laptop for teen and adult users. Product Dimensions 11.57 x 7.87 x 2.5 in.